The first time the intelligence community issued public warning to government and industry executives traveling overseas came before the 2008 Summer Olympics in Beijing. Joel Brenner, then the head of U.S. Counter Intelligence in the Office of the Director of National Intelligence and a former National Security Agency inspector general, said taking your phone, laptop or other device to China was dangerous and would end up with lost data and the real possibility of having your home network compromised. Now, 11 years after that initial warning, the Department of Health and Human Services is taking it a step further. While most agencies prohibit executives taking devices to countries like China or Russia, HHS is not letting officials take any device with government information overseas no matter the country. HHS Chief Information Security Officer Janet Vogel issued a memo in December addressing the increased level of risk and the need to safeguard government furnished equipment (GFE) while on foreign travel. Only loaner GFE encrypted devices are allowed on foreign travel. Devices received from foreign nationals/governments (i.e., conferences, gifts, etc. ), and devices purchased while on travel are not permitted to conduct HHS business. Secure remote access via Virtual Private Networks (VPN) is required. No sensitive data (e.g. personally identifiable information [PII], protected health information [PHI], HHS intellectual property, etc.) are permitted on loaner GFE, unless the devices are encrypted. All GFE devices used while on foreign travel must remain powered off during travel to and from foreign countries, segregated from HHS networks/systems, and submitted to the IT Helpdesk immediately upon return for evaluation and sanitization. All devices must be sanitized upon return and before re-use. This means whether an HHS executive goes to China or Germany or Canada, the device and information on it are considered at-risk. One federal cyber executive, who requested anonymity in order to speak about their agency’s security requirements, said the HHS policy is one of the strictest in government. The federal cyber executive added that in some ways HHS is solving a people problem with technology instead of the other way around. “People are lazy. It’s as simple as that, and if it gets complicated people don’t want to deal with it. This is why a technology-first approach makes sense,” the executive said. Brenner, who now teaches at the Massachusetts Institute of Technology and and runs his own consulting and law practice, said it’s more than people are lazy, it’s a lack of understanding especially by executives. “They don’t want to deal with the aggravation and having to take special steps before they go and when they get back,” he said. Vincent Sirtipan, a portfolio manager in the physical and cybersecurity division in Office of Mission and Capability Support in the Department of Homeland Security’s Science and Technology Directorate, said agencies have focused for a long time on mobile device management (MDM) software to protect their devices. But that is only one piece of the bigger puzzle. Sirtipan said DHS recently completed is fifth review under the government cybersecurity architecture review (GovCAR) initiative that looked only at agencies’ mobile infrastructures. Jon Johnson, the former director of the enterprise mobility program at the General Services Administration, and now director at Redhorse Corp., said agencies have had standards from the National Institute of Standards and Technology to several years for their mobile devices. He said NIST 800-124, work by DHS S&T and others have increased awareness, and now it’s just matter of agencies understanding their risk postures. Sirtipan said NIST and others in government are updating SP 800-124, and the draft revision should be out for public comment in the next few months. Sirtipan said while adding more technology and standards are helpful, it comes back to the user. And that takes us full circle to HHS. Vogel, the HHS CISO, said since cyber threats cross all borders, more needs to be done. These, and probably a host of eye rolls, sighs of frustration and shakes of the head, came fast and furious last week when the General Services Administration announced it was rescinding all 81 awards made in February 2018 under the Alliant 2 Small Business governmentwide acquisition contract (GWAC). GSA withdrew the awards after the Court of Federal Claims ruled in favor of Citizant in its protest of being excluded from Alliant 2 SB awards. The judge found GSA erred in evaluating proposals, specifically around having a qualified cost accounting system and price reasonableness. The judge told GSA to re-evaluate all bidders to address the errors Citizant pointed out. GSA made the initial Alliant 2 awards in 2017 for the unrestricted track and February 2018 for the small business track. Procurement experts say while GSA doesn’t have to necessarily start over, the re-evaluation could take six months and then the procurement would take another six months to get through the expected protests. Another federal procurement attorney familiar with the case, who requested anonymity because the sensitive nature of the proceedings, said the judge expected GSA to hold everyone to the same requirements and during the discovery part of the case, it became clear the contracting officer didn’t do that. A spokesman for Citizant declined to comment on the judge’s decision. Alliant 2 SB remains under protest even with the Citizant decision. Three more cases from RX Joint Venture LLC, TISTA Science and Technology Corp. and Metrica Team Venture are before the appeals court. So far over the last three years, the Alliant GWAC process has faced more than 40 protests. Franco said as GSA and other agencies continue to develop these large multiple award contracts, agencies will create problems that these types of contracts were trying to avoid in the first place. Foreshadowing problems for other MACs? The Alliant 2 small business experience is the perfect precursor to what is likely to happen to several procurements that are just getting off the ground. GSA and the Air Force’s 2GIT multiple award contract with a ceiling of $5.5 billion is just getting started and could face a pre-award protest right off the bat. Industry sources say vendors are concerned about violations of the Small Business Act of 2010. Then there is GSA’s Center of Excellence Discovery blanket purchase agreement, which is entered the second phase of the acquisition process. 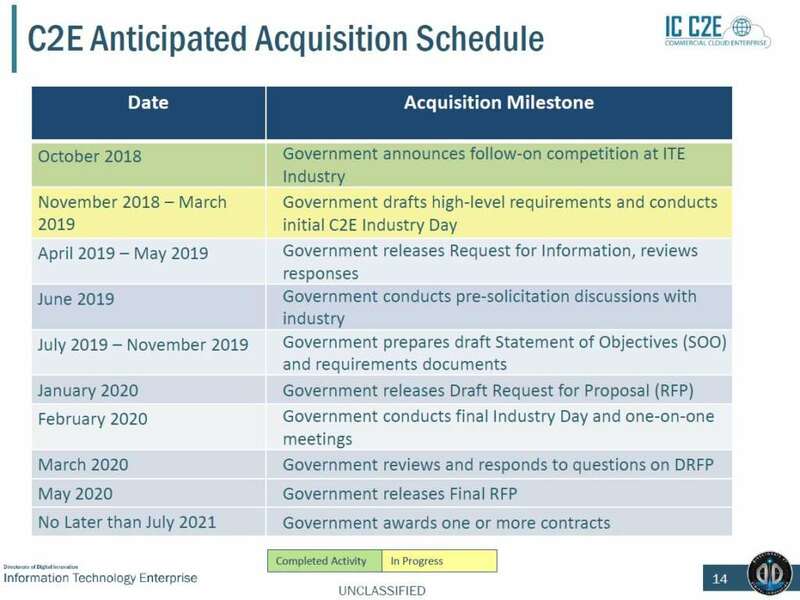 Last week, the Federal Acquisition Service posted seven challenge questions for each of the areas with a due date of April 1. In no more than 1,500 words, FAS wants vendors to outline their approach to determine where things stand now, the path forward for implementation and how they will ensure modernization efforts continue beyond implementation. Both of these procurements as well as the others that are coming over to GSA schedules as blanket purchase agreements, including those MACs from the FBI and the Homeland Security Department, have the strong potential to face protests from unsuccessful bidders. And like the Alliant 2 small business GWAC, it’s to ask if all the time and resources that go into these contracts is worth it. Maybe it’s time to think of another way like having Congress modernize the GSA schedules so this need to create BPAs on top of the schedules or standalone GWACs can go away. This would be a huge step toward getting agencies and vendors alike out of this protest merry-go-round. The government hasn’t had a permanent chief financial officer, or in government talk, a controller, for more than two years. Dave Mader, now at Deloitte, was the last person to hold the title of Office of Management and Budget controller and he left in January 2017. The Trump administration is now considering its nominee, Fred Nutt, who had been waiting since September 2017 for Senate confirmation, for another position in the government, according to a senior administration official. This means the administration will be three years old before it has a permanent CFO. A Senate Homeland Security and Government Affairs Committee staff member said Nutt never received a vote in the full Senate because there were concerns about his qualifications. The aide offered no further details about the concerns. The committee held Nutt’s confirmation hearing in May 2018. And like I said with the administrator of the Office of Federal Procurement Policy last summer, and the Federal Chief Information Officer before that, Where art thou, OMB controller? The controller’s role is even more significant when you consider that nearly every initiative under the President’s Management Agenda has a financial component to it. These include the obvious ones like getting payments right or federal IT spending transparency, but there also ones like moving from low-value to high value work where so much of that work is being done in the financial management community through robotics process automation (RPA) at places like the General Services Administration and the Department of Housing and Urban Development, or sharing quality services, where key milestones are around things like payroll modernization and other back-office functions. Treasury released that document in August seeking to improve federal financial management across four areas. Another federal financial management official said the CFO community is tightly coordinated and understands the path it must follow. Is the OMB controller even necessary anymore? So that leads us to the question of whether a Senate-confirmed controller is even needed anymore? Similar to what I heard from the procurement community, federal financial management experts say there are definitely things having a Senate confirmed controller helps with, but CFOs and deputy CFOs know what they have to do to get the job done and move things forward. Experts praised deputy OMB controller Tim Soltis for both is leadership and accessibility to the community. Reger said while Nutt, serving as a senior advisor to the OMB director, can participate in meetings and can influence priorities and plans, he can’t, however, draw people together, be the public face of the financial management community or lead the CFO community like a permanent controller would be able to. The first federal financial management executive said having that leadership in the community would be especially critical right now. Add to the need for a leader becomes more critical now that the Government Accountability Office is performing a review of the CFO Act of 1990. “As part of our study, we are seeking information from the CFOs and deputy CFOs of federal agencies to assist us in obtaining information on progress in federal financial management as we approach the 30th year anniversary of the CFO Act and in identifying challenges and leading practices,” the GAO letter to the financial community states, which Federal News Network obtained. And to take this discussion one step further, the lack of permanent CFOs across the agencies is dramatic. Of the 24 CFO Act agencies, at least six agencies don’t have permanent CFOs. AGA’s Ebberts said the lack of permanent CFOs across the government is as big of a problem as not having a permanent controller. So the question comes back to whether the Trump administration will comprehend the importance of the OMB controller and get someone in place before 2020, or will it continue to under estimate the impact and critical role this and other management positions play in making the government run well? The news that CenturyLink passed the last major hurdle to begin offering services under the $50 billion Enterprise Infrastructure Solutions (EIS) contract isn’t necessarily going to set off a tidal wave of solicitations from agencies. CenturyLink is the first vendor to receive its authority to operate for its business systems, meaning it can accept and process task orders or service orders, provision or deliver services and bill for services. Other incumbent vendors such as Verizon and AT&T aren’t far behind, and the six other “new” companies should be completed in the coming month or two. Until those vendors receive their ATOs, EIS will remain on a slow roll as agencies are hesitant, maybe even a little fearful of bid protests, to make awards until they feel like there is adequate competition. While this is only one expert’s opinion, others in and out of government believe most agencies will wait until the vendors have their ATOs, thus putting the General Services Administration’s March 31 deadline for agencies to release their EIS solicitations further in doubt. As you may remember, GSA changed the transition timeline for agencies with the caveat of March 31 and Sept. 30 deadlines for releasing solicitations and making awards, respectively. GSA is extending the current Networx contract to May 2023. Source: GSA blog post from March 14. Additionally, Zielinski said since the 35-day government shutdown didn’t impact most agencies, GSA is keeping to its schedule, but will work with agencies on a case-by-case basis if they need additional help or time. Bob Woods, a former GSA telecommunications official and now president of Topside Consulting, said GSA should instill and agencies should have a sense of urgency into the entire EIS effort. Multiple government sources involved in the transition say OMB hasn’t sent any memos, guidance or instructions related to EIS transition, and it hasn’t come up too often during CIO Council meetings. 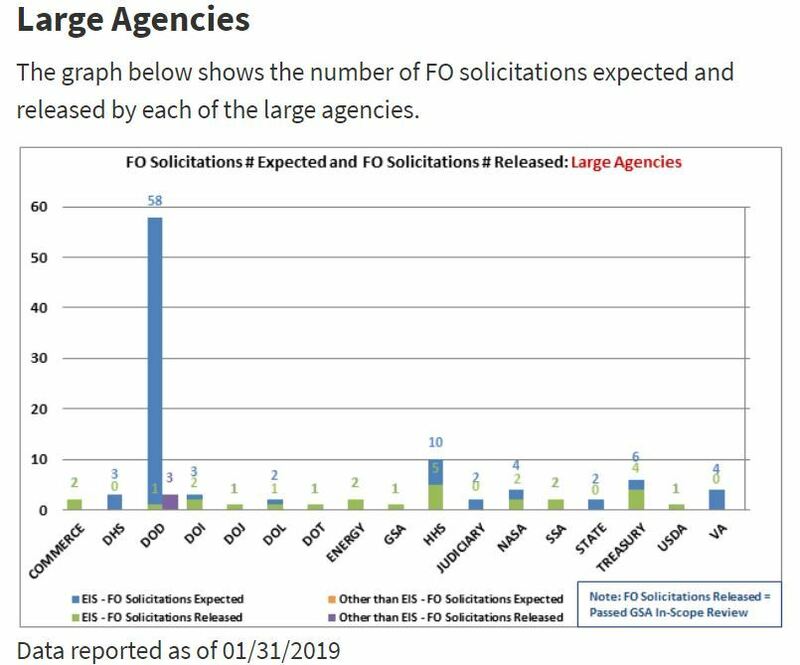 And so far as of Jan. 31—the last time GSA updated the transition chart—large agencies released 25 out of an expected 104 solicitations. The Defense Department accounts for 58 out of those 104 total RFPs. 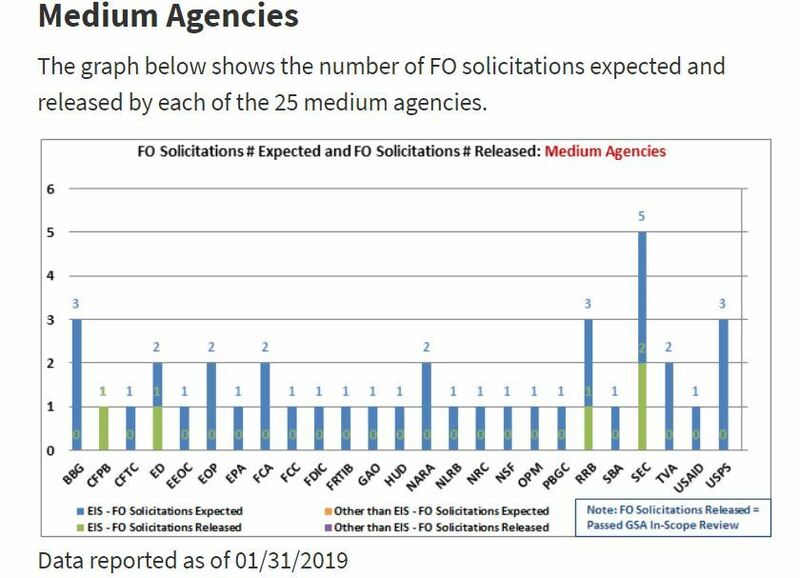 The medium-sized agencies are further behind with only 5 of 40 solicitations out to vendors. The federal executive added their agency is having to hire more people and processing the orders and dealing with the billing will be more costly for the agency. 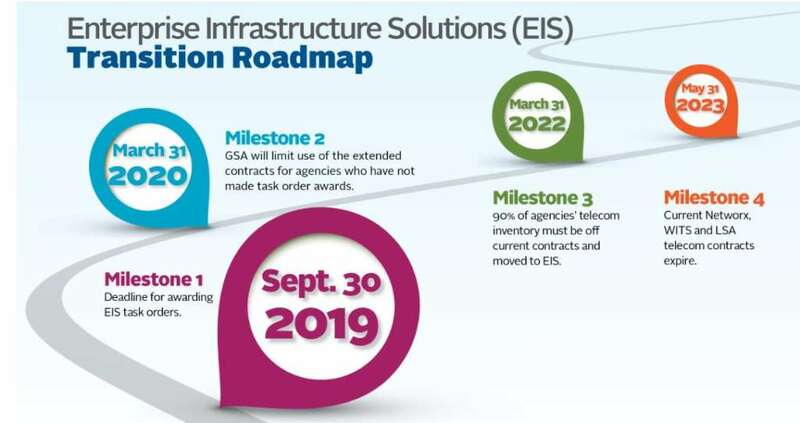 The first executive said they expect their transition to EIS to take two years in part because they expect the provisioning of services to take longer due to the complexity of the EIS contract’s approach using task orders. Experts also say whenever the tsunami of solicitations come out, vendors and GSA alike likely will be overwhelmed. Quietly, two agencies are making moves in their chief information officer shops. The Transportation Department didn’t wait long to fill its vacant CIO role, hiring Ryan Cote without much fanfare. Cote, who started Feb. 4, came to DOT from Gartner where he was an executive partner. Ryan Cote started as the Transportation Department’s CIO on Feb. 4. He replaces Vicki Hildebrand, who left in December after just over a year on the job. While Transportation filled its role quickly, the State Department hasn’t had a permanent CIO for more than 15 months, and now its acting CIO, Karen Mummaw, is retiring in April. Sources confirm to Federal News Network that Mummaw announced her plans to leave in February. State hasn’t had a permanent CIO since Frontis Wiggins retired in December 2017, and may not until the Senate confirms State’s undersecretary of management nominee, Brian Bulatao, who has been stuck in the nomination process since July. Cote comes to Transportation after spending four years in the Marines and then his entire career in the private sector. 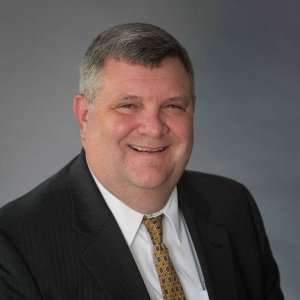 He worked as the CIO and senior vice president of IT at iForce, a staffing and recruiting company, and for IBM as a senior practice consultant. As the DOT CIO, Cote likely is picking up where Hildebrand left off in reshaping how the agency uses technology through the nine BHAGs—big, hairy, audacious goals—that focused on everything from cybersecurity to shrinking the IT footprint to implementing intelligent software. DOT has a $3.7 billion IT budget, with 78 percent of all projects are on schedule and 68 percent are on budget, according to the federal IT dashboard. Among his biggest challenges will be to continue the partnership with the modal organizations, particularly the Federal Aviation Administration. Over at State, Mummaw caps a 31-year career at State where she spent her first 10 years as part of the Foreign Service working in technology and telecommunications roles at various embassies around the world and has spent the next 21 years working at both headquarters and overseas as an IT executive. During her tenure, Mummaw helped led State’s continued transformation to the cloud. State has two main goals as part of its modernization plan: the centralization of back-office or commodity IT and consuming IT-as-a-service. State still faces several challenges with its $2.2 billion IT budget, of which Mummaw’s office controls only about $725 million. The federal IT dashboard says 84 percent of State’s projects are on schedule, but only 52 percent are on budget. Additionally, State continues to recover from a recent breach of its unclassified email system. The National Institute of Standards and Technology and the CIA also are looking for new CIOs. NIST posted a job opening on USAJobs.gov in late February. Resumes are due March 27. The CIA announced its CIO, John Edwards, received a promotion to be the deputy chief operating officer. On March 19, the agency named Juliane Gallina, a former CIA officer currently at IBM, as its new CIO. She will start April 1. NextGov first reported the CIA’s hiring of Gallina. 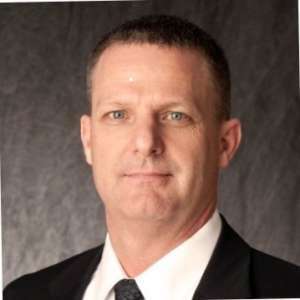 Edwards has been the CIA CIO since March 2016 and served 14 years as a communications and technical operations officer within the Directorate of Science and Technology (DS&T) and five years serving as the chief of staff to the CIA’s executive director. During his tenure, Edwards led the CIA’s move into the commercial cloud hosted by Amazon Web Services, and making it a part of the broader intelligence community IT modernization effort. Additionally, he implemented what he has called a “franchise” model for IT where CIA offices must adhere to a strict set of standards and security requirements, but are able to operate their own IT infrastructures. Among his long-term priorities, Edwards focused on mobility, interoperability, data management and ensuring capabilities at the edge. Additionally, the Government Accountability Office is looking for a chief data scientist, the Agriculture Department’s Agriculture Research Service is looking for an assistant CIO to run its technology efforts, and Washington Headquarters Services in the Defense Department is seeking a new CIO. Finally, Somer Smith is the new permanent chief of staff for Federal CIO Suzette Kent. She had been acting chief of staff since August. Smith had been a performance analyst for the Office of Management and Budget since August 2017. This also means OMB is hiring a new supervisory policy analyst. “The position performs duties related to IT reform efforts, consistent with the Information Technology Oversight and Reform (ITOR) fund. Additionally, the incumbent will collaborate with agencies and policy teams in terms of the CIO Act, cyber policy initiatives, Evidence Based Policy and relevant executive orders,” the job listing states. 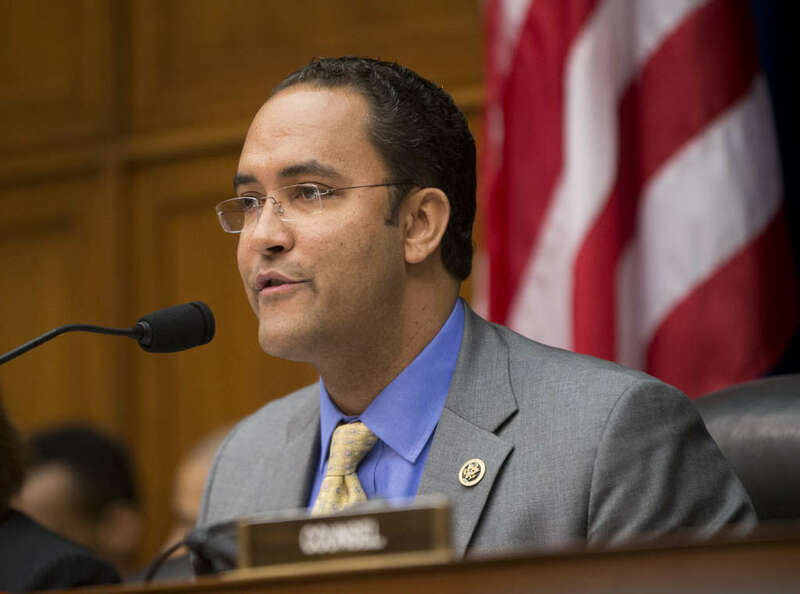 A single tweet on Thursday about something Rep. Will Hurd (R-Texas) said at the IBM ThinkGov event in Washington, D.C. created quite a bit of discussion and debate. Hurd said he’d like to see the government be able to complete a security clearance in a week instead of six months or, in many cases, more than a year. That single comment and ensuing tweet opened a torrent of frustration about the security clearance process that, while the feelings aren’t new, contractors and agencies seem to be getting less patient with the government’s efforts. It’s not like the last three administrations haven’t recognized this problem, trying an assortment of approaches. The most recent statistics show progress against the backlog, which is a good sign, but far from a fix. The National Background Investigations Bureau said the number of pending investigative matters stands at 542,000, down from 725,000 a year ago. The Trump administration is transferring the NBIB to the Defense Security Service any day now, an executive order has been stuck in the ubiquitous “soon” of government talk for what seems like six months. At the same time, agencies from the Air Force to the Office of the Director for National Intelligence to the Defense Information Systems Agency are testing new approaches or fixing the technology to accelerate the security clearance process but not lose any rigor. The Air Force, for example, worked with the NBIB to establish temporary centralized interview hubs at 11 key locations where there is a high concentration of investigator case work and the mission in those areas needs immediate relief. Hubs are areas where security clearance interviews can take place without requiring someone to go to Washington to be vetted. ODNI started to use a continuous evaluation approach in 2017 to supplement and enhance the current process, but not replace it. While these two examples show change is possible, Hurd wants to transform the security clearance process even more quickly. Hurd said the arduous clearance process impacts many of the issues he works on, which is why the he asked whether a week to get a security clearance is possible. “My goal and my time will be spent on going out there to figure out a test case to do this and let’s introduce this,” he said. Hurd’s comments came as two other initiatives — one on Capitol Hill and the other from the Defense Department — kicked off to put more focus on security clearances. Warner and Collins said the bill also lets federal employees appeal decisions to deny or revoke a security clearance, and requires agencies to be more accountable and transparent about the results of those appeals. Finally, the bill would apply more rigor and accountability of to the process to prevent abuses. A major reason why Collins and Warner introduced this bill can be traced back to the Trump administration’s handling of security clearances for the president’s son-in-law Jared Kushner as well as the administration’s decision to withdraw security clearances from former intelligence officials over political disagreements. But if you take a step back from the big “p” politics of the bill, the move to continuous evaluation or using social media and other public information as part of the basis for a decision requires more transparency and accountability in the process. And the need for transparency leads us to the second initiative around security clearances from last week. The Defense Digital Service released a request for white papers to collect ideas to develop a prototype for automated background and reviews. Questions are due March 19 and white papers are due March 26. DDS said it eventually will award a nine-month contract worth no more than $5 million to a vendor to build the prototype system. The DDS efforts come as DISA has been modernizing the current online background investigation form for the last nine months and has been working on new technology to support the security clearance process since 2016. DISA recently transferred the technology infrastructure and employees to the Defense Security Service in early March as part of the consolidation effort. With all this attention, the administration must not only make progress, but communicate how the security clearance process is improving while not losing any rigor. The opaqueness of NBIB’s efforts over the last year — aside from a recent update from ODNI’s Bill Evanina — has undoubtedly led to the frustration we saw when Hurd’s comments were spread to a broader audience. The Trump administration’s initiative to reskill and retrain federal workers is picking up steam. Federal Chief Information Officers Suzette Kent announced last week that the Federal Cyber Reskilling Academy received more than 1,500 applications, of which half of the employees were GS-5 to GS-11s. Federal Cyber Reskilling Academy applicants are completing assessments through the end of the day today and we look forward to having the inaugural class begin April 15th! Kent launched the academy in November to address the shortage of cybersecurity expertise across government through hands-on training. The first class is expected to hold 25 people who will be given a “cyber essentials” course, followed by four weeks of “follow-on learning, exercises and exams” over a four-month period. An approach to talent acquisition, talent development, talent analytics and talent management. Describing software/technologies used to support talent acquisition, talent development, talent analytics and talent management. Using advance technologies such as machine learning, artificial intelligence, simulations, virtual advisors, interactive autonomous programs, mobile applications and gaming. Addressing Federal Risk Authorization and Management Program (FedRAMP) certifications, federal cloud computing, security and interoperability with existing federal IT systems. Approaches to career pathing, competency identification and management, job roles, progression models and management, workforce and succession management, position management, performance management. Providing operations and maintenance for software, mitigation and contingency operations. “The key area of focus for this requirement is to gather information on industry best practices in the talent management and talent development arena and explore the new and future technology to support competency gap identification, employee re-skilling and agile workforce career management, while enacting best practices to elevate employee experience and engagement,” the RFI states. Responses are due March 15. The Defense HR Activity may be a part of the Trump administration’s broader effort to modernize the workforce, which is a key cross-agency priority goal under the President’s Management Agenda. Source: Performance.gov December 2018 report. Additionally, the goal leaders say agencies want better technology and automation tools to make career paths easier to understand for employees. “Respondents noted that career paths have the potential to yield improved outcomes in recruitment, retention, succession planning, talent development and reskilling. An industry day is planned for January 2019 to engage leading private sector career-pathing providers to explore how to better serve agency and employee needs, preferably through an enterprise service available to all agencies,” the goal leaders write. Additionally, the National Science Foundation launched a reskilling challenge soliciting prototypes that NSF — and later all of government — can use to match existing federal employees and their skills to other kinds of work. Public and private sector experts say agencies can move thousands of people out of low-value work and use automation to make up for that work. OMB estimated in 2018 that about five percent of all federal occupations could be automated entirely, while 60 percent of all occupations could have at least 30 percent of their work automated. Overall, OMB says 45 percent of all “total work activities” could be automated. Deloitte’s Center for Government Insights found government has the potential to free up anywhere from 266 million hours to 1.1 billion hours a year by retraining employees and using automation. The appetite and potential for federal employees to move into new fields, whether it’s cybersecurity, data science or many of the other emerging occupations is real. The administration shouldn’t waste this opportunity because of big “P” politics and reach out to House lawmakers and employee union officials. The reality is change is happening, it’s just a matter of how quickly it can come and if OMB and OPM aren’t inclusive and strategic about all of this potentially impactful and needed work, agencies either will be stuck manually inputting data into Excel spreadsheets or they will make change on their own, which tends miss the important point of moving everyone forward together.